You're at day 274 of 280. (97,9%). You have completed 39 full weeks and 0 full days (v39+0). You're in the 9:th calendarmonth. You're in the 10:th pregnancymonth. Calculated due date Thurs 1 sep 2011. You have 6 days until due date. I didn't have any energy left to write this weekend, felt like I had enough to do anyway, haha. This saturday my grandmother, her "boyfriend", my aunt and her youngest child came here and visited. We ate good food, spoke and just had a nice time here, and then they stayed the night here aswell. So the entire saturday went there, and half of the sunday aswell, then we got some sparetime, haha, and then I didn't have any energy to update the blog to be honest :) My aunt also brought me a lot of babythings that she no longer needed and wanted to get rid of, so now I have updated my baby-collection with two babysitters (one upstairs, one downstairs, so I won't have to carry it up and down the stairs all the time), a second babygym (same there), a babysling, a music-mobile for the bed, a cute hanging teddybear for the stroller, and lots and lots of toys such as these soft books, mirror-toys, cubes, etc etc. A lot of good and nice things, thanks a lot! You are at day 267 of 280. (95,4%). You are in week 39. You have completed 38 full weeks and 0 full days (v38+0). You are in the 9:th calendarmonth. You are in the 10:th pregnancymonth. You have 13 days left until your due date. Now I'm going to get back into my warm bed and just lie there for awhile and watch tv or something :) Hugs! The day started with that I had go to the store to buy some things for the baking, then I did a daim-mudcake, again, and while it was in the oven me and my brother ate lobscouse. After that I continued with a coco-toscacake. Our oven is fucked up, though, and while the cake should've been in the oven for 20-30 minutes at first, I started doubting it after 15, but left it in a few minutes more. So after about 18 minutes or so I took it out and it was almost burned instead, like it would've lasted another 2-12 minutes? And then I added the cocotosca on top and it was supposed to be in the oven another 10 minutes, but I had to take it our after 5.. So I hope it's okay anyway, I don't want to burn it but then again you start to think about if it's actually ready yet or not since it was in so much shorter. The edges tasted okay though, apart from a bit burned taste (they managed to burn since they are, in fact, the edges..) so the middle of the cake should be fine? Haha. I should've been baking doat-doublets aswell, but my little mother didn't buy everything I needed for it and I was too lazy to drive to the store AGAIN, so I'll bake them later. The whole reason why I've been baking is because my grandmother, her "boyfriend", my aunt and her child is coming to visit this weekend, so we need something to share for them :) Unforunately (or fortunately? :) both me and my mom loves baking, so we'll have quite a lot of goodies to share, haha. I'll write more about that later. Now I'm going to plan tomorrow with Joss, seems she's stopping by here, nice! I know it's late and all of that, but I just have to write this! I was just logging into a website to check the pregnancy-calculator once because I was speaking about the pregnancy with a friend of mine. "You have 18 days until due date", it said. Like, 18 days? +- 2 weeks on that. 4-32 days. I'll have my baby in my arms within a month! Oh well, now you at least got a little update about what is happening around, because that's pretty much everything that did happen, haha! I'm sooooo bored during the days, so if someone wants to do something, just call me! Oh well, I'm going to relax a bit more and then I think I'll do something good and actually iron a bit, don't you think? Sounds like a boring but good plan? Take care out there, hugs! Oh, I'm so bored at home, haha.. Feels like I just go around and try to make time pass, kind of. And I don't know with what either! Most of the fun things aren't fun to do alone, in my opinion at least. So it almost feels like I'm just sitting here, watching the clock slowly, slowly turn around. Oh, god, this sounds depressing. Can't the baby come out soon? It's only 28 days to due date now! Exactly 4 weeks that is, and it's most probable that it'll show up within 2-6 weeks then, it's not that long! Or well, it is like forever with my time right now, haha. Oh, take me back to Finland? Have so many thoughts running through my head at the moment aswell so I can't figure out something to do anyway. I just keep repeating the same thoughts over and over again, not good. Eh, I guess it'll work out in the end, won't it? Now I'm going to brush my teeth and lighten up the aquariums, and therefor spend another ... 5 minutes of my time doing something? :) Haha, take care out there, hugs! Yeah, as I said I was at the midwife today. I think it's kind of cozy to be honest, see that the baby is fine, see that the stomach is growing as it should etc. 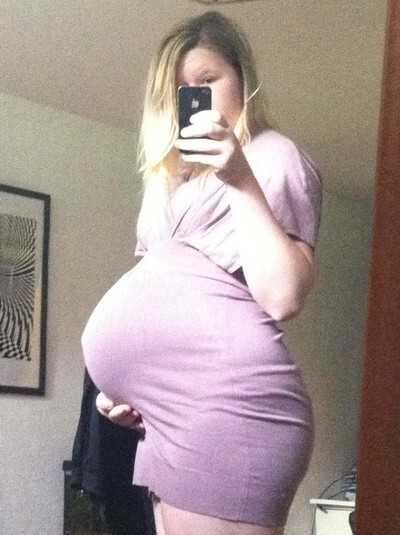 The stomach keeps growing according to the line it should and the baby's heart is beating good, wonderful! Less wonderful is that my midwife is leaving for 4 weeks vacation now and I get the annoying midwife I had earlier. Bleh. And hopefully I won't go overtime, and in that case she's the one I'll have until due date. Bleh, again? I really don't like her, but oh well. Two weeks until next visit and then it's only 2 weeks until the original one is back, so I'll have to take it I guess? Haha. 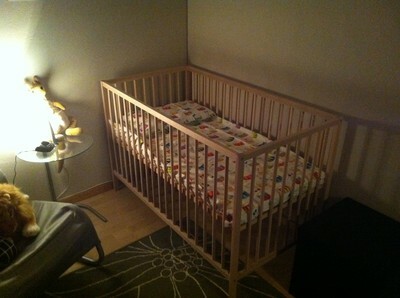 Also, there might be IKEA today, if mom wants to and aren't going out to exercise with the rest of the family :) Then we'll get some more bed-clothes (one pair doesn't go that well, haha), bottomsheets, blanket and the crib-protection so a leg or arm won't "fall out" and the baby get stuck :). 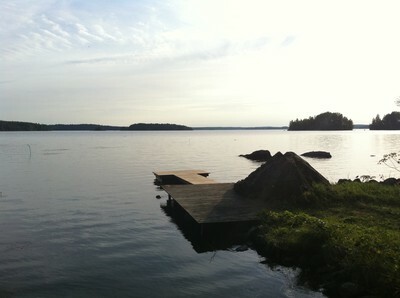 Here's the picture from Antti's summerhouse that I promise you aswell! Now I'm home from my first stop for the day, the dentist, surprise surprise with my title there! Oh well, I had to fix a tooth, so had to go back and do it now, bleh. At least I feel like a good-girl because I managed without ... anesthesia? My translator told me that at least, but you know that thing that makes you feel nothing, haha. Anyway, I made it without that, but to be honest, taking it scared me aswell, so it was courage mixed with fear that made me do it without, haha! Although, the drilling part didn't feel too much, felt a bit towards the end, but the hardest part was to lie on my back! I was lying there 10-15 minutes then I HAD to get up, felt all dizzy from lying like that, so got a little break, then they filled the tooth and gave me a new break. Needed those breaks, can't lie on my back for that long I noticed. And then she got to great idea to remove scale from my teeth in the end, and that hurt so much more than anything else. If I would've taken the anesthesia it would've been for that part in that case. Bleh... But I survived! Take care, and I'll write again after the midwife, hugs!